← We Are Who We Are! How has your road trip been so far? 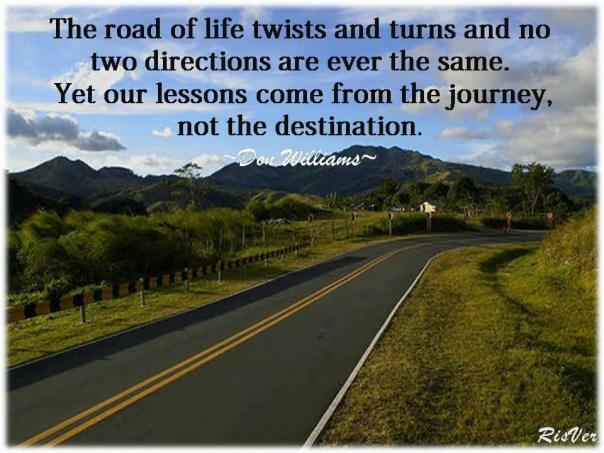 Have you been able to negotiate the twists and turns? I’ve heard the comparison of a road map as a reference to our own lives and I can relate. 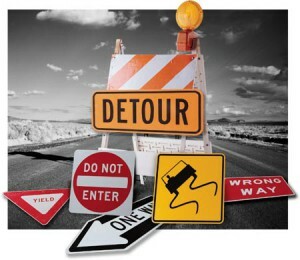 Some of the various roadblocks that come up in our lives are there for a reason, some are a result of choices made (good or bad), some are there to teach us so we can learn and grow, some are there to serve solely as a “déjà vu” reminder to keep us from straying too far from the main road. Most of these turns, bumps and challenges are in place to keep us on the straight and narrow, although sometimes we get off course, take a wrong turn and end up on the wrong end of a one-way street. Sometimes we get ourselves so far off course that our GPS is continually “re-calculating”. Sometimes you end up having to make a complete U-Turn and go back to where you started. Sometimes, you just can’t get there from here! Not every road leads to a better life but all roads provide us with an opportunity for personal growth. Along the way we can find great friends, love, passion, purpose and a greater understanding for how impactful positive thinking can be. The Universe knows where we should be going but we have our own free will to ultimately decide. I’m going to link this post to the “Related Articles” section on my “Be Your Own GPS” (http://wp.me/p8zy7-8p) post, Shelley! I think it’s fitting! Hope that’s OK! Of course that’s great! Thanks Danielle!